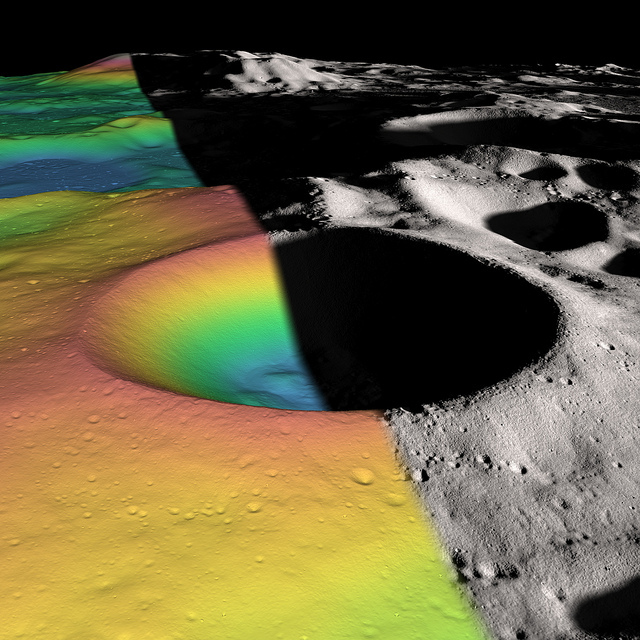 NASA’s Lunar Reconnaissance Orbiter has found water ice lining a deep crater located on the Moon’s south pole — as much as 22% of the surface material of the crater appears to be composed of ice, NASA and university scientists report. Named after the famed Antarctic explorer, Shackleton crater is two miles deep and over 12 miles across. Its position at the Moon’s south pole keeps its rugged interior in permanent darkness — and thus incredibly cold. In fact, craters like Shackleton have some of the coldest temperatures yet discovered anywhere in the entire solar system. The relative brightness of the crater’s floor and walls seemed to indicate a reflective, icy composition. When investigated further with LRO’s laser altimeter, it was found that up to 22% of the interior surface of Shackleton is icy in nature. The mapping of Shackleton sheds new light into the darkest reaches of a crater that was created over 3 billion years ago… and has likely changed very little since. Although ice appears to be somewhat widespread throughout the crater, the actual amount of water is not very much — only about 100 gallons (378 liters) of water would make up the amount of ice found thus far in the surface material. But what’s beneath the surface has yet to be determined. Still, the discovery of ancient ice on the Moon may help scientists find out what sort of conditions existed in our neck of the solar system billions of years ago, and perhaps where some of Earth’s water may have originated from. most of earth’s oceans come from Saturn when Saturn was a binary companion to the sun. A black hole or a small dense dwarf star passed by this binary system and ripped up Saturn into neptune and uranus (and possibly jupiter) 4500 years ago. The hydrogen surface of the binary reacted with Oxygen from the core and water fell on all the planets and moons of the solar system. This explains why titan is covered with water,being the closest to Saturn. The craters all over our moon and others are from gigantic, interplanetary lightening bolts millions of miles long causing pitting marks you see on spark gaps of Tesla Coils. No wonder Jupiter is pictured as throwing lightening bolts at the other gods(planets) in past celestial wars.